STUDY GROUP TOMIKI AIKIDO hold regular monthly European sessions open to all black belts throughout the world of Aikido. The sessions are primarily held in Antwerp and under the supervision of Shihan Eddy Wolput. The aim is to try to understand the teachings of Professor Tomiki, Ohba sensei, Yamada sensei and others who now follow. By continuous research and focus on basic skills and their applications, we learn proper balance and posture and reduce some of the mystery which surrounds our system. In this quest to improve, students from Belgium, Bulgaria, Germany, Holland, Ireland, Japan, Norway, Slovakia, Spain, Switzerland, England UK, Scotland UK and Ukraine have attended to date. As a non-political group we work together promoting the true spirit of Tomiki helping to maintain universal friendship. 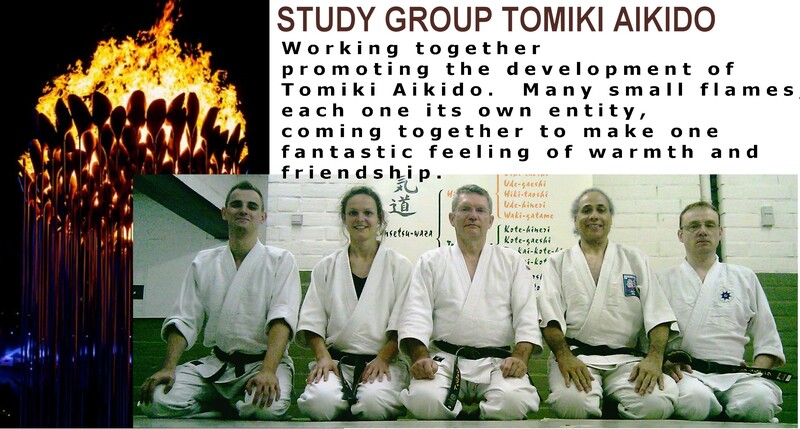 STUDY GROUP TOMIKI AIKIDO SESSIONS FOR 2019 . . .
We started the Study Group idea in late 2008, just by coincidence and as a method of Yudansha training. Someone was looking for a partner to do a JAA 6th Dan Grading. After a while, the interest for the grading ebbed away because the content of the syllabus for grading was in some ways conflicting with teachings of Senta Yamada and other early instructors in Europe. The plan was made to come together on a regular base to study the “original” teaching of Senta Yamada. We discovered a much larger version of Senta Yamada’s movie. We also have a movie and some direct experience with Teruo Fujiwara (an old student of Tomiki). And some of us practised a lot with Dr Lee ah Loi, Takeshi Inoue, Itsuo Haba. We also have a good relationship with Fumiaka Shishida, Tadayuki Satoh, Yoshiomi Inoue. To share all this knowledge is the purpose of the Study Group. 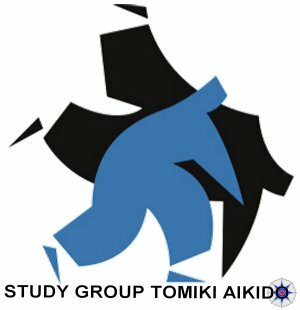 In 2013 the Study Group Tomiki Aikido achieved JAA recognition. Palm up “lift”, by this we mean think about the relationship between the two triangles formed. The upper is shoulder palm elbow; the lower is ...hip shoulder elbow. In both cases there is an imaginary line. In the upper triangle the imaginary line runs shoulder to palm. In the lower triangle the imaginary line runs hip to elbow. These imaginary lines are where the link lies. As the lower line lengthens the upper line does too. Power is generated without the forced use of the related muscles. When the lines are shortened there becomes a point when the mid-section of the body limits the movement so we make space by “concaving” the body. But we mustn’t do this and lose the stability of the lower body. This is maintained as we lower the hips. We make space here by opening/rotating (neither word describes the action precisely) the legs and closing the buttocks. Additional internal muscles are used here to maintain lower-spine-neutral. The movement should be done with a leading elbow, which must not wander outside the body centre. Much is the same as in Inside Sweep, but we had in mind the image of John Travolta acting/dancing in “Saturday Night Fever” as he stretched his arms, heaven to earth. It is this stretch across the shoulders as the action is made in the horizontal plain. Much is the same as in Inside Sweep, but we had in mind fixing the head and shoulders to a wall to stop any movement. Space is made for the elbow pulling the tummy muscles in and up. A spiral action within a tube is used as the hand is turned over. Ideas concentrating on extending the middle finger were studied. When the wrist is grasped, the idea of adopting “Gedan no gamae” to neutralize Uke was considered. We looked the concept of Yin and Yang and that it only exists when there is a common mutuality. Tori’s gripped wrist is a state of Yin and Yang where there is a common point for Kuzushi to be effective. The turn of Tori’s hand should not extend along the arm and rotate the elbow to the outside, which is weak and encourages the use of the shoulders. Over the weekend these basics were applied to “Jo-Throw” techniques and the complete Koryu Dai Yon. POINTS TO CONSIDER WHEN OBSERVING SKILL LEVEL. Two hands Yin & Yang, the balance may move from one to the other. Yin and Yang only exist by agreement, a point in common. eg Uke grips Tori's wrist, reverse posture, regular grip. Tori start outside sweep action, Uke feels drawn to a weak point along the weak line. AIKIDO - How Many Dimensions? 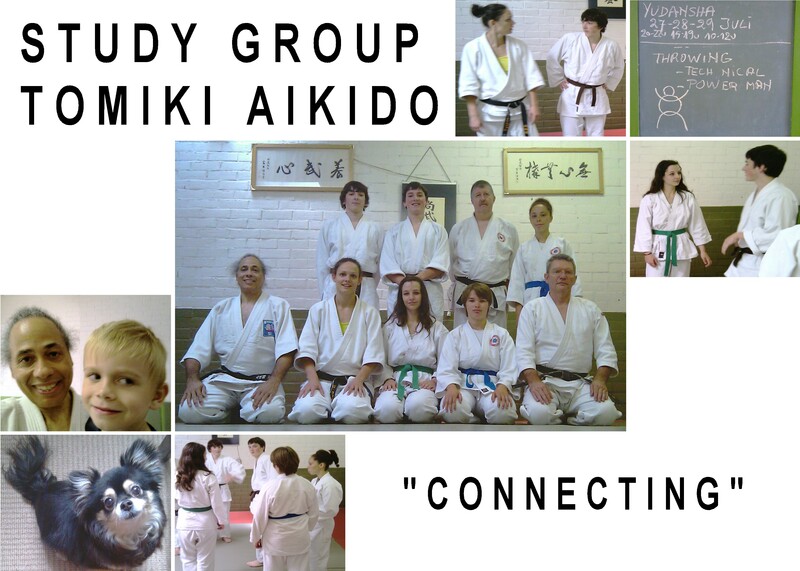 Our study group met again last weekend, (Thursday 23rd to Sunday 26th February, 2012) and this month we were at the Shobukai Dojo in Antwerp, Belgium. T...his week we have had a chance to put into practice some of the concepts that we explored. Once again we worked on how to get the most from Unsoku and Tando Ku Undo the idea of stretching the middle body was studied, but we needed some additional “tune up” exercises in preparation for this. We worked on the idea and difference between a drill and a fight to improve performance, using the concept of a body "frame". This should be consistent and adaptive in order to check the performance of Tori. Uke should not just block or fight, by doing this, Tori develops an entirely different skill. We talked about strong-line and weak-line for throws. We also referred to strong and weak directions in order to break, control or disturb balance. In a sense this is all just a two-dimensional analogy. The picture highlights this limitation, where we are trying to show more than two-dimensions, using arrows etc., but the picture is flat! In the Archway of Coke Cans the central vertical “Key Can” represents the base of the spine or lower Tanden. The two halves of the Arch support this solidly. The bottom cans represent the outside edges of the feet, forming a firm base. The legs form an arch that is mechanically strong like a bridge. A picture and explanation by Yamada Sensei can be seen on page 24 of his book. When we practice Unsoku we can do it lightly, mechanically and swiftly or we can drop our posture and stretch and open our bodies into each movement. The outer edges of the feet drive down creating a stable base. The real skill is to be able to move from one version to the other, which is what is done during Randori. The idea of moving without moving was explored in the Randori session where rotational movements without stepping were needed. The revolving Coke Cans rolling together is the analogy here and helps to explain this whilst using applications of “Arm-Hip-Turn”. Various exercises were practised, where the body and arm move together in this way. Page 55 of Yamada Sensei’s book shows these in basic form. Overall in Randori it was found that although the concept of ”tegatana-awase” was applied, in practise the distance to execute a technique was generally much closer. We worked on the idea of a spiral inside a tube. This is depicted at the top of the picture. This horizontal “spiral power” was used in some techniques from the Koryu no kata. Later we combined this with a vertical spiral down. We spent time studying the early Tomiki movie where he appears to stretch the body in a technique, rather than pull with the muscles. We studied some elements of tachi tai tachi - sword to sword from the koryu no kata dai san. Conceptualising a line, which is part of a circle. In reality there are three-dimensions. So maybe it is better not use "line" or "direction" but "point". This is specific and links directly to the vectors involved and is three-dimensional. The idea of balance in power throughout a technique was studied. Finding the correct mix of Yin and Yang. A fifty – fifty balance rather than a ten – ninety or ninety – ten mix is best. As the weekend progressed, we soon realised that in many respects there is a forth-dimension; this is one that comes from within, the will to keep trying to master this. The spirit. Feeling the exercise from the heart outwards. First visualising the exercise and its meaning and purpose. These stages of learning cannot be fast-tracked or shortcut, it is a process which begs perseverance. Please see the basic hand exercises, pages 50 to 56. On page 55 Arm Hip Turn is described. The idea of two rotating cylinders can be used ...to reinforce the action of the arm and body as they pass each other. The sheet of paper between the two cylinders high-lights the direction of the power produced by this action. Aptly named "Coke Can ku Undo". This was one of the items studied in the Session. When we do "Inside sweep Turn" the Coke Cans (Body and Arm) rotate in one direction and in the other when "Outside sweep Turn" is done.